At a glance, the Tangent VITA 474 19” panel PC looks just like a nice monitor. Sure, it’s very slim, sleek and unassuming. One could very easily pass it by on a wall or desk and never imagine that it is a powerful, fully featured all-in-one touchscreen panel PC. It even goes beyond just PC features and incorporates popular tablet computer components like a front-facing camera, integrated HD audio, wifi connectivity and Bluetooth wireless. With the Windows 10 app store and android emulators, you can take advantage of the highly responsive touchscreen while running mobile apps. But that’s not to say the Vita is just an oversized tablet. This panel PC is an industrial grade workhorse that can operate 24/7, at extreme temperatures, and has no fan or other moving parts. The front panel is rated at an IP64 level of protection against dust, water on contaminant intrusion. This panel PC’s hardware setup is customizable to suit the needs of business, be it as an infotainment station for customers and patients, an electronic medical records keeping computer, or as an in-room patient care system. It is offered with an Intel 6th Gen Core i5 or an Intel Celeron processor, an Intel Skylake chipset, up to 32GB of memory, an optional RFID module for easy login, and hard drive/SATA drive options with storage of up to 2TB. The VESA 75/100 mounting bracket and optional stand allows for versatile placement of the panel PC for nearly any desired place: walls, arms, desks, or in-vehicle. The touchscreen is a sensitive, but durable PCAP 10 point multi-touch with a non-glare LED backlit LCD. All these features are packaged up in a flat panel that is only 16lbs. 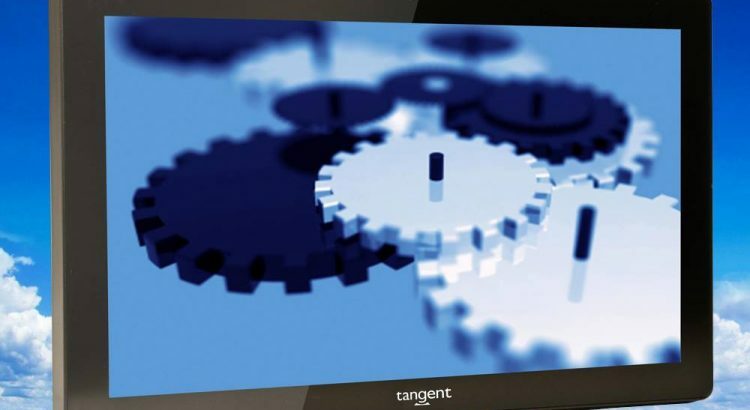 If 19” isn’t quite the size you’re looking for, Tangent offers industrial panel PCs that range from 15” to 24”. Tangent also has lines of panel PCs that are more rugged and sealed for use in harsh or highly sanitized environments. The S-series panel PC has an enclosure that is rated at an incredibly secure IP69k, meaning that it can withstand being washed with jets of high heat water. The F15 panel PC has a cast aluminum chassis that is ruggedized for use outdoors or on vehicles, and has function buttons on the front for one-handed operation. Even with specialized features like these, the panel PCs all still retain the same functionality as all-in-one computers and tablets as to be truly versatile systems.